My summer starts in one day. Even though there is still lots of snow on the ground (le sigh), I am done with the university school year and will not have to teach nearly as much over the summer. I will also not be performing at all this summer, and sad as that is, it is actually a huge relief. Because, more time to read! I'm trying to knock out a few books that have been hanging around on my to-read list way too long, as well as a few new ones that I've been excited to read. 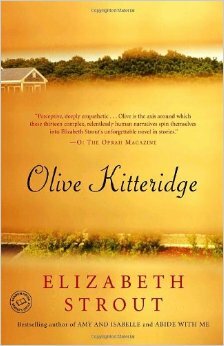 Olive Kitteridge by Elizabeth Strout has been on my to-read list for so long that I don't even remember exactly why I added it. Except that I added it in 2009, which is when it also won the Pulitzer Prize, which is probably exactly why I added it. It is actually a series of 13 short stories, all having to do with Olive Kitteridge, the small town of Crosby, Maine in which she lives, and Olive's learning about life. From Amazon: "Olive Kitteridge offers profound insights into the human condition–its conflicts, its tragedies and joys, and the endurance it requires." I tend to really enjoy books that "offer profound insights into the human condition," though others might see them as depressing. I usually find I have a lot to learn from them and am very uplifted by them. 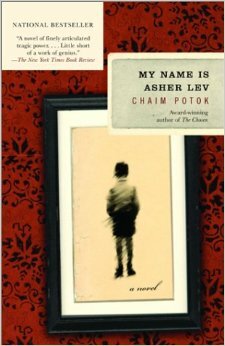 My Name is Asher Lev by Chaim Potok is another one that's been sitting in to-read purgatory for several years. I chose it as the book club selection that I will be hosting this summer, though, so I will finally be forced to read it. From Amazon: "Asher Lev grows up in a cloistered Hasidic community in postwar Brooklyn, a world suffused by ritual and revolving around a charismatic Rebbe. But in time his gift threatens to estrange him from that world and the parents he adores. As it follows his struggle, My Name Is Asher Lev becomes a luminous portrait of the artist, by turns heartbreaking and exultant, a modern classic." At dinner the other night, Chloe was talking about The Hunger Games. I had finally let her watch the movie because she finished the book. Chloe: "The book was WAY better than the movie!" Bria: "The book is ALWAYS better than the movie. If I were President, the first law I'd pass is that people have to read the book before they see the movie." 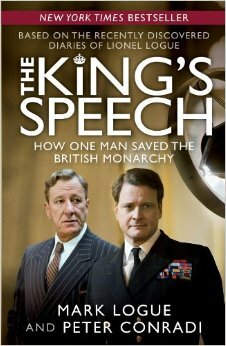 Speaking of seeing movies before reading books, I commited that cardinal sin where The King's Speech is concerned. I saw the movie a couple years ago, and I've wanted to read the book ever since. Normally, I do not ever see R-rated movies, but I did a lot of research beforehand, and talked to a lot of my friends who know and support my values, and they all agreed it was fine to see. And it was. It was cleaner than a large portion of PG-13 movies that I have seen, which just makes me think that the Hollywood rating system is messed up. But, I'm excited to read this book. I really loved the movie (who doesn't just adore Colin Firth?) and I'm interested to know the more of the story that the book is bound to tell. Since that's the reason the book is always better than the movie. 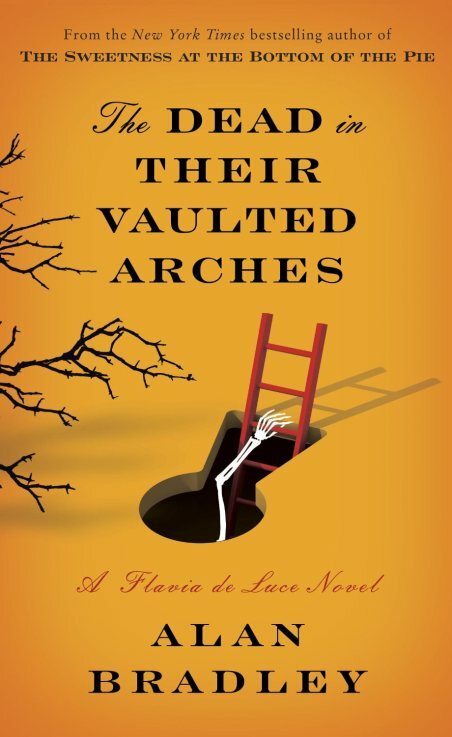 The Dead in Their Vaulted Arches by Alan Bradley is the just-published sixth installment in Bradley's Flavia de Luce series. I have fallen completely in love with Flavia. She is a 12-year-old genius who loves chemistry. 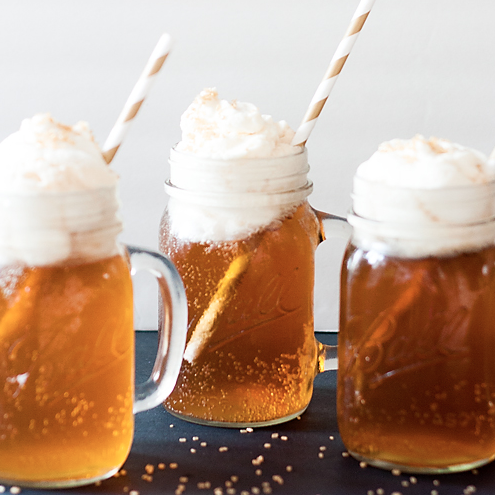 She lives in 1950s England and spends her days concocting poisons, solving mysteries, and riding her bike, Gladys, all over the English countryside. She is constantly getting in trouble with the local deputy, the vicar, her sisters, and her father, but she always, always, always solves the mystery. If you've not read any of the Flavia series before, start with the first (The Sweetness at the Bottom of the Pie) and go in order, because there are important plotlines that continue through the series. I just finished the fifth book in March, and there was quite a cliff-hanger so I'm particularly excited to start this new one. 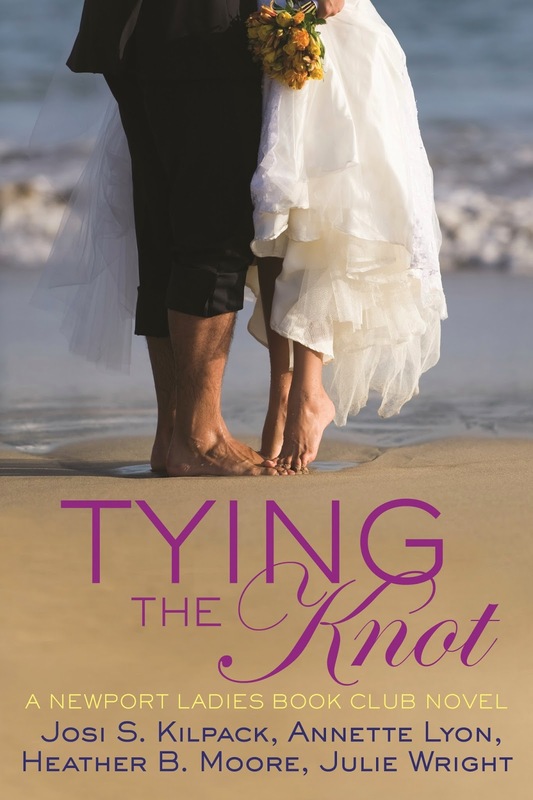 Tying the Knot is the final installment in The Newport Ladies Book Club series written as a team effort by authors Josi S. Kilpack, Annette Lyon, Heather B. Moore, and Julie Wright. I have really enjoyed this series, about a book club and the women in it. The prior eight books each focus on one member of the book club and the things that are happening in her personal life. They discuss the books they are reading (they once read My Name is Asher Lev), they help each other, they hurt together, they rejoice together. It's just a really wonderful series about friendship. And it is only made better by the fact that the four women who write it are obviously very good friends themselves. This is a series that you can pick up anywhere, except I think you do have to save Tying the Knot for last since it ties up some of the loose ends in previous books. And then there is self-improvement. 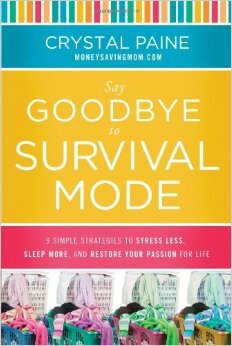 I read an article about this book, Say Goodbye to Survival Mode by Crystal Paine, a couple months ago. When I read that article I was completely in the throes of Survival Mode, so I didn't bookmark the article or write down the title at all. Then, last month, I ran a giveaway on my Facebook page and I asked the participants to tell me which book they were currently reading. I was so happy someone mentioned this book, because I immediately went over to Amazon and purchased it. I am constantly in Survival Mode. Or, if I'm not, I'm in Shut-down Mode. Both of those modes aren't very good for me, and it's sometimes hard to find happiness. I'm looking forward to seeing what the author has to say--I hope that it will help me have a better school year beginning in the fall! 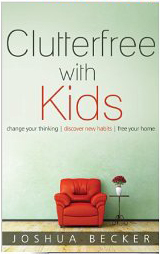 The other book I am going to read for self-improvement is Clutterfree With Kids by Joshua Becker. I just came upon it on Amazon one day, and decided to buy it because sometimes the clutter threatens to drown me. Especially when I am already in survival mode. From Amazon: "Children add joy, purpose, and meaning to our lives. They provide optimism, hope, and love. They bring smiles, laughter, and energy into our homes. They also add clutter. As parents, balancing life and managing clutter may appear impossible—or at the very least, never-ending. But what if there was a better way to live? 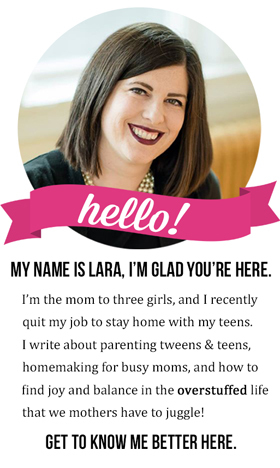 Clutterfree with Kids offers a new perspective and fresh approach to overcoming clutter. With helpful insights, the book serves as a valuable resource for parents. Through practical application and inspirational stories, Clutterfree with Kids invites us to change our thinking, discover new habits, and free our homes. It invites us to reevaluate our lives. And it just may inspire you to live the life you’ve been searching for all along." What's on YOUR summer reading list? I really want to know! Because I'm definitely going to be reading more than 8 books this summer, that's for darn sure. Follow my Reading Rocks Board on Pinterest! I've already read the first 3 on your list. Olive Kitteredge is so good. On my list to read in the next little while are Dune, and maybe more in the Dune series, some books about writing children's nonfiction, and the new Veronica Mars book. Oh yeah, and I'm reading a new book called "Beyond Baby" by Meagan Francis that is about moving to the next stage of life when your babies aren't so little anymore. 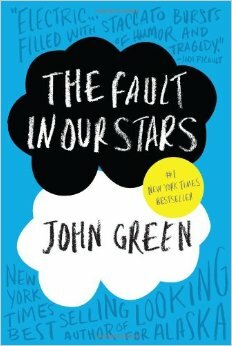 I only read the fault in our stars from your list (and am part of the minority who loathed the book), but I loved your list! This is such a fun thing. I love reading. My to-read pile is pretty big right now, I've got The shipping News for my book club, I'm trying to finish off all YA series I started (Abandon, Still Blue, Across the Universe). I also have the second book in the wheel of time, and Gone with the wind on my "this is too scary and long" pile. I hope to get through them all this summer! I haven't read any of the YA novels in your pile. I'll have to look those up. I love Gone with the Wind. It's so long, but so very good. 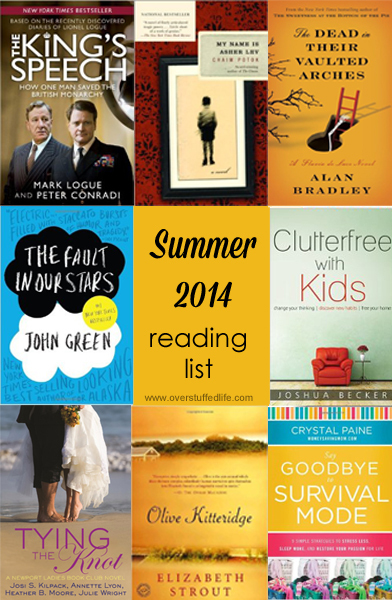 I love summer for getting through books, I feel like I haven't had time to read forever! Great list, adding a few to my own. I also adored the Kings Speech. We even allowed our 4 boys to watch it, with one scene muted (ha!! They could totally tell it was cussing and laughed hysterically even when muted). So many great lessons in that movie! Love These! I read so much during the summer!! Hm, from the ones in my pile, I think none of them are really worth the waste of time. Across the Universe is the most interesting one, but I'm not sure I'd actually recommend it to someone. It feels like the kind of read that is very particular to taste. I mean, I read everything and I especially like fantasy and sci-fi, so I guess it works for me. I'll get to Gone with the Wind this year, I promise! You will enjoy My Name is Asher Lev...I read it in high school, and I have my own copy floating around here someplace...or I may have taken it to school for my bookshelf. Great book! I also want to read The Fault in Our Stars. And, let me just say, this Flavia series sounds very intriguing...I've never heard of it before but it sounds like something right up my alley! Those two self-improvement books sound great too. Full time teacher, full time mother- who's not constantly in survival mode! And, clutter? I'm constantly trying to get rid of it, and they are constantly bringing it in! ACK! My current project has been to get rid of Mt. Washmore (With six of us, it's all too easy to have an over abundance of clothing!) and with my husband as the sous chef at the local shelter, I usually just send it with him! You must read Flavia. I'm now in the middle of the book I linked here and I am loving it as much as ever. Thanks for stopping by--nice to meet a fellow mom in survival mode who doesn't know what to do with the clutter or the laundry! May the force be with us! This gets me thinking about what I want to read for the summer. Never to early to start thinking about summer! I may have to add a few of your titles to my list - Olive Kitteridge looks good. Have you read "Still Alice" by Lisa Genova? Soooo good. 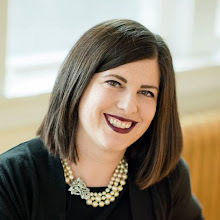 Visiting you via "booknotes' linkup. I haven't read "Still Alice" but I just put it on my to-read list! Thank you for the recommendations! I stole two from your list to add to my own. I just finished The Fault in Our Stars. It was witty, romantic, and I agree it's a must read before seeing the movie!